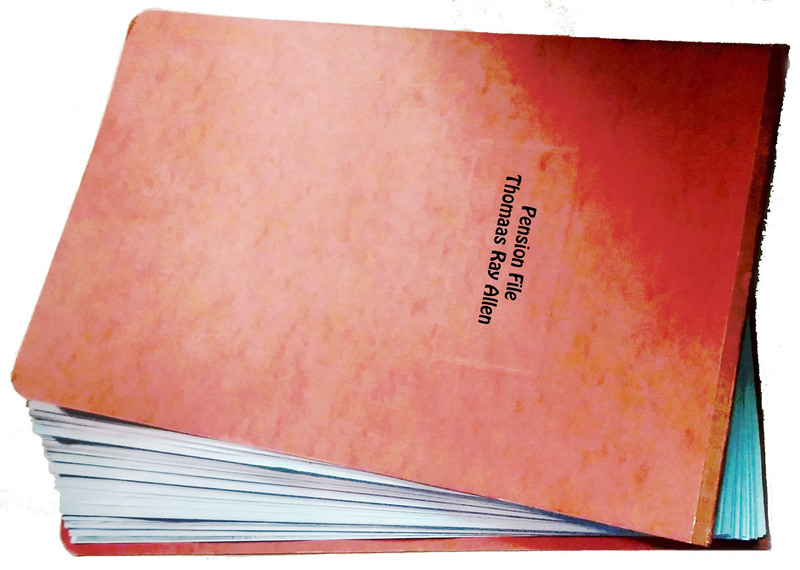 This year for my 5th A to Z Challenge, I used my 2Xs great uncle, Thomas (Ray) Allen’s pension file as the basis for my blog posts. Thomas served in the United States Colored Calvary during the Civil War. In his 115 page pension file, I was able to find family members, friends and veterans who served with him during the war, plus the name of the man who had enslaved him. In spite of pledging myself each year after the challenge to prewrite my posts, I found myself once again doing last minute research and writing most of the posts on the day I published them. Towards the end of the month it came to me that I should pick a topic that doesn’t require research and is guaranteed to produce short posts. “Fleeting Memories” is the topic I am thinking about for next year. I have already filled a tiny notebook with them. A big difference this year was the lack of a list including everybody who signed up where we could go and find blogs to visit. 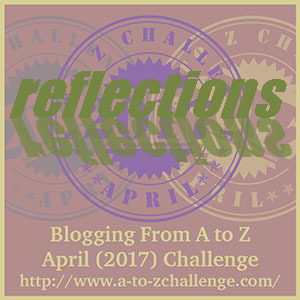 Instead there was a post each day where we could reply with our blog url, twitter with #atozchallenge and a fb page. Not to mention our own fb pages and google+. What worked best for me was visiting blogs I had enjoyed in previous A to Z Challenges and visiting people who commented on blogs I enjoyed . 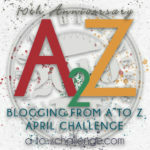 I ended up following about 30 blogs during the challenge, with one time visits to others. I visited as many of these as I could each day and commented. I visited those that visited me and I tried to reply to all comments on my posts. Looking back over my posts and comments for this year and years past, I received about the same number of posts this year. I couldn’t find a reflections badge this year, so I made this one. Feel free to use it. B – Bluford Hubbard – Served with Thomas in the U.S.C.T. Great reflections and thanks for the shoutout. I did the same as you: planned to pre-write posts, then ended up writing them all during the challenge. I also hope to do more writing ahead for next year. Thoroughly enjoyed your Thomas Allen saga and the wealth of documents his Civil War pension application generated. Hope to keep up with your blog during the year. 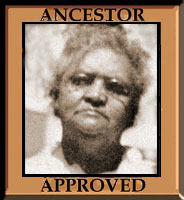 As a parting gift, check out http://road13.com/familyhistory/ for an interesting story of a fraudulent pension application. This may be why our ancestors were put through so much when they applied! I can’t believe there were many who took on the identity of a dead soldier and scammed their way to a pension! How unfair that he got one at all. There is some quote, “Queer cases make bad law.” and this is a pretty queer case! I really enjoyed your theme and learnt and thought more about the US after the civil war. I was nearly not going to participate this year as I did not think I had another year’s posts in me. I went through my draft posts and managed to convert many of them into A to Z posts. Ideas I had meant to write about but never got around to finishing. It still look a lot of work each day to finish but at least I was not looking at a blank screen wondering what to write. The only letter I was really wondering about was U and it didn’t quite fit my theme but it did match the day , the 25th is a day we remember War service here. I’m glad you found the posts that let you do the A to Z this year. I enjoyed your posts, as long as I didn’t try to speed read and get confused like I did with that one about the pirates! At this point every year, I tell myself I will do this next year, and again, I will do this next year. I hope you do! It’s really nice to look back and see all those people I wrote up now that it’s done. My blogging had fallen off over the past year. You had such a wonderful, original theme, Kristin , for this year’s clallenge, and the number of blogs you managed to follow was impressive. I like your intriguing title of Fleeting Memories for next year. I did not realise there was no linky list this year, nor subject coding – was that a reason why there seemed to be fewer FH entries that I came across? I do hope to be better organised to take part in 2018 and already have my theme in mind. The problem I have with pre-writing my posts over the year is that if I do any family history/genealogy research and write it up, I want to post it right then! I figure a tiny theme like fleeting memories will not tempt me in that way. We’ll see what really happens. I think quite a few people who did FH challenges in years past, didn’t this year. I went about the challenge more or less the same way you did. I didnt’ really bothered about the comment section on the official blog because it was simply too overwhelming for me. Instead I relied on social media and above all on the blogs themsleves, reciprocating visits, discovering through othe people’s comment sections. I just found you this year, through a comment on someones blog, and I am glad I did. Once again I was amazed and educated by your indepth research. You put a lot of work into your blog, way more than my cursory Wikipedia research, and for that I applaud and admire you. You’ve created an amazing repository of information here and I hope it keeps up for a long time to come! Like you I found myself falling back to blogs I’ve already followed in the past, I found it hard to find new interesting ones. Those I did find weren’t until later in the month. I enjoyed your Wikipedia research. In past challenges I found my most interesting blogs in the same way – through comments on other blogs. 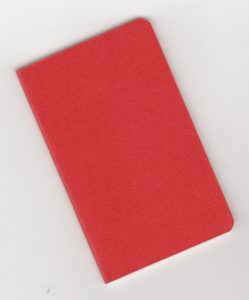 Other years I felt that I HAD to go through some of those on the linky list everyday and I didn’t feel that way this year about the comment list. Kristin, I really enjoyed your posts and can’t imagine how difficult this research is to do. Hopefully next year, I will write some posts ahead of time so I can devote more time to reading what others have written. Very well done! 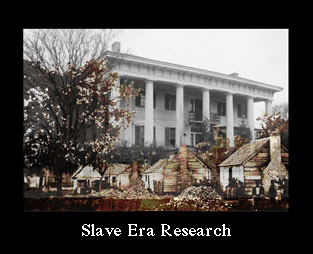 I research almost everyday so it’s not as hard as it used to be. I greatly enjoyed your posts, and thank you for coming by my blog (and for the shout-out 🙂 ). I, too, intended to have all my posts ready before the start of the month, but failed to do so. At least mine were very short and easy, mostly (and most of the others re-used previously published material). The research you did for your posts was impressive – kudos. I enjoyed the ones I read for the pictures they painted, a personalised account of a huge historical event. Congratulations on completion and a cogent Reflections post. Thanks so much for the shout out. I confess I was one of the visitors to your blog who didn’t leave comments, and now I feel rotten because you so kindly included me in your list. Thank you so very much. I laughed at your reflection about researched pieces… ditto here! My posts ended up taking half of way too many days in April. If I participate again, it needs to be something that has shorter, off-the-top-of-the-head entries. Unless I pre-write. Which is little more than a pipe dream. That’s okay if you didn’t comment. Thanks for letting me know you were here and commenting now. I’m hoping my memory pieces will be much as you describe. At least there will be no research as I want to do those memories that just bubble up from nowhere. Heh – you’re sure right about posts that require research. I’m impressed that you were able to pull so much together. Good luck with all the ongoing exploration into your family! I’m thinking of giving myself a month to post even without A to Z to make myself stop researching and write it up! I liked your reflection post. I found your A-Z fascinating. It’s so amazing and cool that you have access to history in the way that you do. Your topic was excellent. Glad to hear of your positive experience with the 2017 Challenge. Thank you for sharing these Reflections.